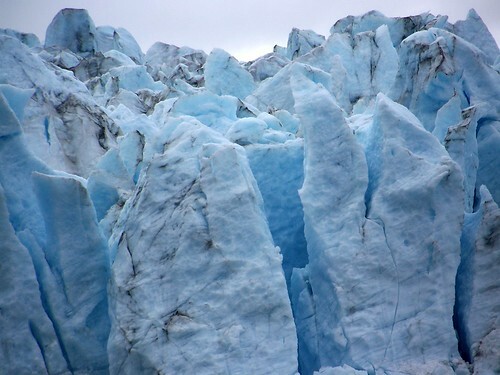 This is a link to James Balog's photography of glaciers around the world. Check out the video of Qarrassup Glacier in Greenland calving. It's reported to be the biggest calving ever filmed and is quite spectacular. We saw an exhibit of this work at the Museum of Science and Nature this morning, in which time-lapse photos of glaciers in motion were shown. The description of glaciers as "rivers of ice" was never more convincing. Unfortunately this doesn't come across so well on the website, but still it's well worth a look. This photographic record is important because the glaciers are disappearing. Not to impressed by the Greenland pictures that show the blue lakes atop that ice sheet-- few know what's normal during the summer months. The receding glaciers around the world are compelling though. I've personally been able to see the shrinking glaciers in Washington State and Colorado over the past 20 years. I live in Colorado, and must admit I haven't paid much attention to glaciers here. I skied St. Mary's Glacier back in the 80s but haven't been back since then. I think the ski area wasn't actually on the glacier and they just had a T-bar lift. Now I'm thinking a summer hike to St. Mary's might be a great idea! I grew up with glacier view from bedroom window. This thread reminded me, and now I see that lolling tongue of ice receded! It's withering! Well, it's supposed to, isn't it? Gah, makes one feel old as Methuselah. Better camp it this summer. Which particular lolling tongue, if you don't mind my asking? By the way, it seems that St. Mary's is not a glacier at all. It doesn't flow so it's just a snow field. Comox Glacier, Vancouver Island, British Columbia, Canada. 30 years ago, that lower part seemed plump and tongue-like, as I recall it, that is. I was in Nanaimo once. It smelled of wet cardboard. I think Mount Arapaho Glacier, which I'm most familiar, has also been downgraded to a permanent snowfield, which is still misleading because it's deep enough to have permanent ice even if it's stationary. My wife and I were fortunate enough to take the Alaska cruise a few years ago. We stopped fotr a day in Glacier Bay; just getting there we passed a number of huge ice sheets, some spreading back for hundreds of miles. The sound is what I recall most vividly; reminded me of rolling thunder. Also, the deep blue colour...truely awesome. Inspired by this thread I went up to St. Mary's this morning with bro-in-law. Here it is. 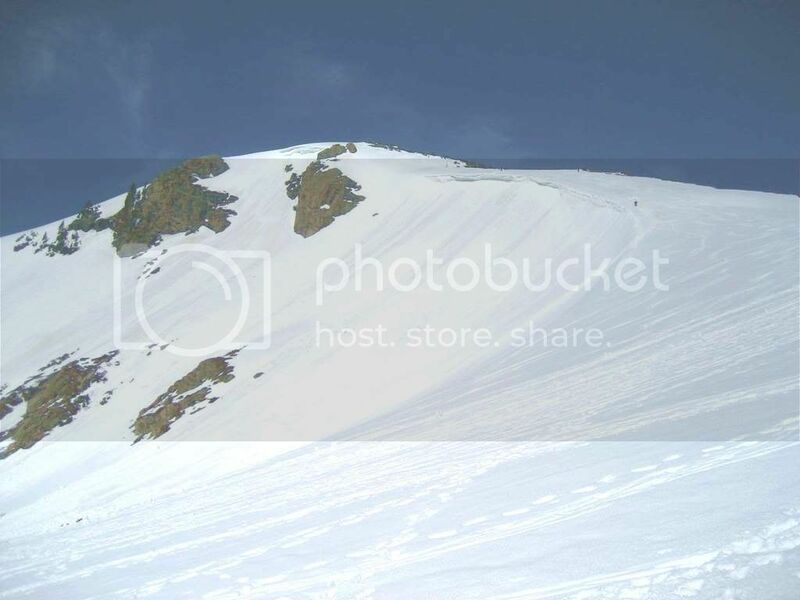 The black speck upper right is a skier. We didn't climb up that far. As mentioned, this is not a true glacier. Even the informative sign at the base has the word glacier in quotation marks.